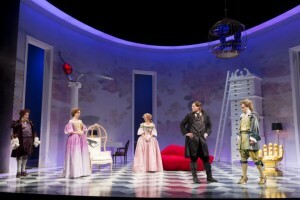 With a few script tweaks and pop culture references, The Shakespeare Theater Company’s production of The School For Lies humorously illustrates the relevance of 350-year old satire at The Lansburgh Theater this month. Tony Award-nominated writer David Ives has retranslated Moliere’s 1666 classic French farce Le Misanthrope into a modern burlesque of salacious couplets, stinging jabs, and bawdy revelry. Swirl in contemporary slang, adorn the set with Jeff Koons and Claes Oldenberg, and voila – a baroque comedy of manners speaks the language of modern day Washington DC: intrigue, deceit, and fake news. Apparently, social hypocrisy hasn’t ceased to be low hanging fruit for witty skewers in hundreds of years. This play should be seen if only to savor the work of David Ives, arguably the most talented working playwright today. Ives brings his newest work to STC after the successful collaboration with STC Artistic Director Michael Kahn for Metromaniacs, The Liar, and The Heir Apparent. Inspired by recent events, Ives reworked his adaptation of Le Misanthrope for the first time since 2011 (HINT: that’s code for “since the election”). Inspired by David Ives, Kahn himself directed this production. It’s a parlor game of words. Molière’s ruthless French truth-teller “Frank” (Gregory Wooddell) despises hypocrisy and makes sure you know it. Frank wreaks havoc in a world of pompous suitors (Cody Nickell, Cameron Folmar, Tom Story, Liam Craig) and extravagant ladies, hurling abusive barbs, flouting convention, and wooing, all with equal gusto. He meets his match in sharp-tongued Celimene (Victoria Frings), a Parisian widow with a rather troublesome problem. The cast is outstanding, most veterans of STC, Kahn, and Ives. Despite strong performances all around, the women own the show. Frings’s Celimene is salty, starchy, soft, and silly all in one. Her makes quips are both biting and human. Her manipulations are audacious, yet she doesn’t lose her sweetness. She destroys suitors with a razor wit, then beckons them scrambling back with a come-hither wink. Dorea Schmidt’s Eliante flouts the “submissive gentlemaid” archetypes, generating some of the play’s best, and most unexpected, laughs. And Veanne Cox steals the show as dour, tightly wound Arsinoe, a veteran foil, with a face that can tell reams with but a wrinkle of the brow. Ives’s clever couplets are not the only course on the menu. The School for Lies is equally a visual feast. Scenic Designer Alexander Dodge‘s set is a buffet of pop cultural bric-a-brac. The centerpiece Salvador Dali Mae West Lips Couch is surrounded by Oldenberg and Koons pop art, and a Pedro Friedeberg gold hand chair, elevating the Parisian parlor to a new pinnacle in kitsch. Murell Horton’s sumptuous and complicated costumes are visual art in themselves, sometimes literally, as with the bard Oronte’s self portrait tunic. Mark McCullough expertly lights the stage, cueing the mood with shifts in color and intensity. 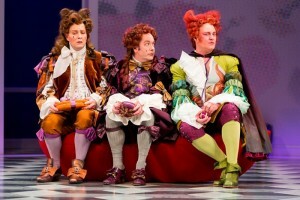 The enjoyment of farce is this: you must forgive it for not being Shakespeare. 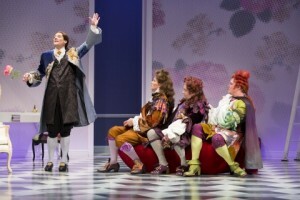 Moliere is Moliere, and must be savored as such. A good satire will endure the ages, because it is grounded in human nature. The School For Lies is farce at its best. This production is notable because it is that rare show where the performers had every bit as much fun as the audience, and you can tell. Treat yourself to a night out and a belly laugh. Catch The School For Lies before it’s gone. The School For Lies is playing at The Shakespeare Theatre Company’s Lansburgh Theatre (450 7th Street, NW, Washington, DC 20004) for an extended run through July 9, 2017. Running time: 95 minutes with no intermission. For information or tickets, call the box office at (202) 547-1122, or click here. 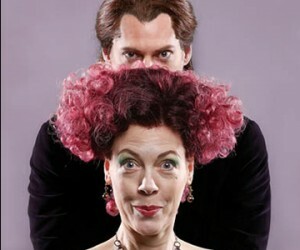 Shakespeare Goes to the Gardens!